I made mention of ogg123. It’s a command line utility to play ogg (vorbis) music files. I like it cuz – with it – I don’t neccessarily need a GUI to play music. For instance, I may play music from one of my headless servers or access points, and those (for the most part) have no GUI. 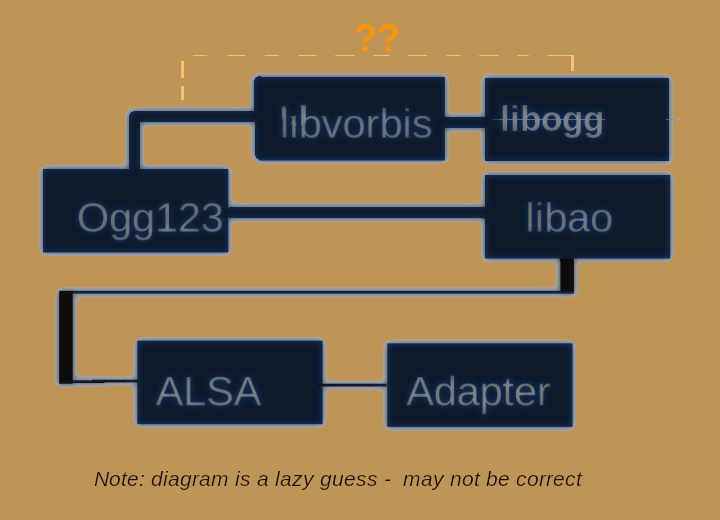 Figure 3: Rough dependency chain for ogg123 utility. This gave me a pulse independent, easy-to-use music player for headless servers and my access points. I suppose there’s admonition coming from somewhere not to do what I’ve done – at least not on servers and access points. Oh well. Don’t do as I do, and be safe. Pulseaudio is a blend of itself and ALSA, but has a dependency on ALSA as well. It replaces the client “user” portion of ALSA with itself. But, I’m no expert about either ALSA or pulseaudio. I do know that they tend to be headaches for people doing their own distros, versus using a pre-baked one, but I think I’m managing the scenario well enough for my own purposes. I just want the Blues and my weather faxes, the rest is optional. I prefer the simple approach always, as it’s easer to fix it. So, I’ve been playing with sndio (from the OpenBSD project) – thinking I may get some of my pulse dependent apps to work with it instead. sndio compiles easily on the XU4 with Gentoo, out-of-portage-tree, as there is no portage package ATM. Note: Gentoo is a product of the Gentoo people at http://www.gentoo.org, and this author and site has no affiliation with them. Odroid is a project of hardkernel at http://www.hardkernel.com, and this author and site has no affiliation with them.